Hey all!! I hope that everyone's Christmas went beautifully, that everyone got to spend time with their families, and that everyone's travels found them safely at their destinations this year!! I must admit, I'm rather elated to be able to not do Christmas themed nails today, is that bad?! :-P Sorry if it is, but yeah, I was running out of ideas!! 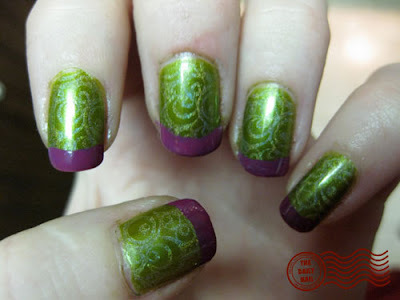 Today's nails make me think of The Mad Hatter for some reason, I think its the acid green base that does it... but not entirely sure. Sorry again for the poor cleanup- still no good remover here at the parents' house. I used Barielle Polished Princess as a base, with China Glaze L8R G8R applied with Konad Plate m65. For the tips, I used Essie Foot Loose for freehand painted tips. Topped everything off with 2 coats of Seche Vite top coat. Anyone get any good after Christmas deals today?? Ooo, I love this!! This is so cute! Very nice, I love the Konad design. I have the strangest feeling... That theme reminds me of Johny Deep. Idk, maybe I'm going insane, finally. Hm.